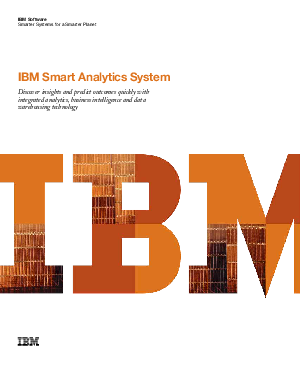 The Smart Analytics System 7700 is one of many ways IBM is providing smarter systems for a smarter planet. The solution is pre-configured, pre-tested and ready to deploy, reducing time to value and lowering IT costs and complexity. Its modulararchitecture ensures linear scalability, while simplified manage-ment and maintenance processes help ensure continuous opera-tion. With a design based on decades of best practices, the SmartAnalytics System 7700 is optimized for real-time analytics, delivering a level of performance and breadth of functionality nottypically found in appliance solutions.